The Winner Junior Teeners are headed to the state tournament in Gregory. In the regional tournament, the Winner team defeated Platte-Geddes for the right to advance to the state meet. The Class B Junior Teener state tournament will be held in Gregory July 20, 21 and 22. Winner’s first game is at 2:30 p.m. on Friday when they play Wessington Springs. Other teams in the state meet are: Garretson, Alexandria, Tyndall, Canova, Greogry and Redfield. 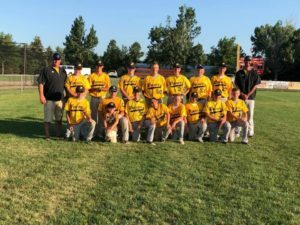 On July 11, Winner defeated Platte-Geddes 9-6. Winner Junior Teeners fired up the offense in the first inning. Charley Pravecek singled on a 2-2 count, scoring one run. Winner scored five runs in the third inning. Winner’s offense in that inning was led by Ethan Bartels, Owen Duffy, Silas Chasing Hawk and Michael Olson who all drove in runs. Pierce Nelson got the start for Winner on the mound as he pitched five innings. Ashton Klein pitched one inning. Winner Junior Teeners had 12 hits. Adam Bohnet, Ethan Bartels, Ashton Klein and Nelson all had multiple hits for Winner. Winner did not commit an error in this game. Following the victory over Platte-Geddes, Winner turned around and played Gregory for the regional championship. Gregory defeated Winner 15-2. Gregory scored nine runs in the first inning and six more in the fourth inning. Winner’s two runs came in the first and fifth innings. Owen Duffy led things off pitching and Riley Orel threw two thirds of an inning in relief. Leading hitters for Winner were Orel, 2-3, Justin Hausmann, 1-2; Silas Chasing Hawk, 1-2 and Ashton Klein, 1-2. The Winner Junior Teeners opened region play with a win over 12-11 win over Parkston in Platte. Winner Junior Teeners trailed 11-10 in the bottom of the seventh inning when Ethan Bartels singled on the first pitch scoring two runs. Winner was boosted by Bartels who went 4-5 at the plate. Bartels singled in the first, third fourth and seventh innings. Winner tied the game at 10 in the bottom of the fourth inning as the local Junior Teeners put up five runs in the third inning. Aiden Barfuss got the start on the mound for Winner. He allowed one hit and five runs striking out three. Charley Pravecek also pitched for Winner. Duffy and Pravecek had doubles for Winner. On July 10, a walk off single propelled Winner to a dramatic 12-11 victory over Kimball-White Lake. Winner trailed 11-10 in the bottom of the seventh inning when Pravecek singled on a 2-2 count, scoring two runs.